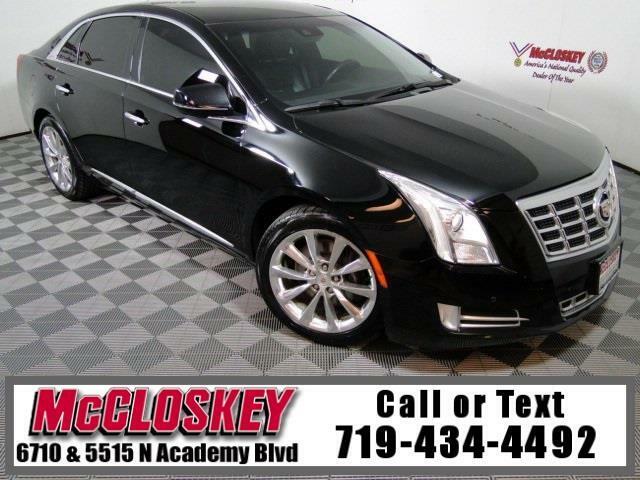 Luxurious 2014 Cadillac XTS Luxury All Wheel Drive with Bose Premium Sound System, Backup Camera, HID Headlights, Leather Heated Seats, and Sirius XM Radio! The XTS Luxury Collection adds LED lighting accents, visible dual-exhaust outlets in the rear fascia, illuminated door handles, rain-sensing wipers, adjustable thigh support for front passengers, extended wood interior trim, a heated steering wheel, driver and front-passenger memory functions, heated and ventilated front seats, heated rear seats, interior ambient lighting, front and rear parking sensors, a rearview camera, an automated parallel-parking system and rain-sensing wipers. The 2014 Cadillac XTS starts with front-wheel drive and a naturally aspirated 3.6-liter V6 engine that produces 304 hp and 264 pound-feet of torque. This vehicle passed our 110 multi-point inspection and is backed by our National Quality Dealer of the Year Award. We are an ''A+'' Better Business Bureau Rated Business. We offer low interest rate financing, low down payments and the highest trade allowances in the state! Here at McCloskey we do things a bit differently, we shop our competition every day to ensure a great value to you. Come on down and experience it for yourself. This McCloskey Assured vehicle includes a 2 month/2000 mile Warranty and a Vehicle History Report!! At McCloskey we strive to provide ASSURANCE, TRUST, VALUE AND QUALITY! Call 719-434-4492.